Heading into game-day 4 in Group C, there is still a lot to play for. The Greeks look imperious but now that most of the hard work is done, you wonder if they will tail off and look to preserve their energy for the knock-out stages or whether they will go full-on to top the group and maintain confidence. There was also another spirited showing by the hosts and the Croatian fans are looking forward to a couple of big days of basketball before the weekend. Despite the Dutch having a strong showing in the second and third quarters, the performances at the start and end of the game offered by Slovenia were more than strong enough to make the difference in this game. This result will leave Slovenia more confident of progressing in the tournament but they do still have some big games to play. Netherlands now hold a 1-2 record and with games against Croatia and Greece to come, they face an uphill battle to get any more wins. 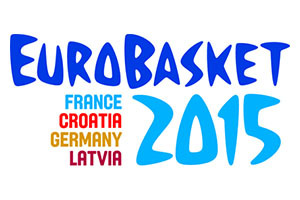 Worthy De Jong grabbed 19 points for the Netherlands while Klemen Prepelic provided 16 points for the winners. A very strong first half showing and some long ball play was all that Greece needed to grab another win the tournament against Georgia. The Georgians rallied in the second half but it wasn’t enough to make a difference. The game ended with Greece on a 3-0 record and Georgia on a 0-3 record, so the fates of these teams look decidedly different going into the last two games. Nick Calathes grabbed 19 points for the Greek side while Tornike Shengelia offered up 20 points and 8 rebounds for the Georgians. It was a fairly even first half in Zagreb but the host team pulled away in the second half to grab a convincing win against Macedonia. Dario Sarci was the key man, grabbing control of the game and pushing the hosts forward. He picked up 15 points in the game, moving Croatia on to a 2-1 record that will lift spirits and confidence with respect to making it through this group. One good thing for the Greek side with the game against Slovenia is that there should be no let-up in the intensity of this one. The Slovenians are on 5 points and will fancy their chances of a result against a Greek side that currently has a 3-0 record. This may be the first game of the day in Group C but it could be one that is explosive with two top teams battling it out. Or it could be a dour tactical display with both teams battling to get the upper-hand. No matter how it pans out, it should be an engrossing match. If the Greek side turn up and are fully focused, they should have more than enough to take this game, so go for Greece with a -9 handicap, at odds of 1.90. If you are looking at the Over/Under market, go OVER 145.0 at odds of 1.90. Bet Now! The two lowest ranked teams in the group coming into game-day 4 know that a win is vital. Georgia are yet to get off the mark but the clash with Macedonia could be their best bet. For the Macedonians though, this could be a chance to grab a big win that pushes them further into contention for the knock-out round. The Georgians are the favourites for this one, but by not too much, but taking Georgia at -4.5, with odds of 1.90, should be a decent bet for this game. If you are looking for the Over/Under market, look to go OVER 144.5 at odds of 1.90. Bet Now! This looks like being a thrilling game and as the last game of the evening in Group C, it should live up to its billing. The home fans will be expecting victory but this is a game between a team on 5 points and a team on 4, so the Dutch players will know that they are in with a chance of winning this, and if they do, the group opens up a bit more. The Croatian team should win but the Netherlands at +15.5, at odds of 1.90, could be a sound bet in this one. Look to go OVER 142.5, at odds of 1.90, in the Over/Under market. Bet Now!